LETBOND® retaining compounds fill the “inner space” between components and cure to form a strong precision assembly. Formulated in a selection of viscosities、gap filling ability、flexibility and strength characteristics. For best results, clean all surface with LETBOND® cleaning solvent. If the material is an inactive metal, spray with activator. General purpose. Green, high strength, low viscosity. Green, high temperature resistant, high strength, high viscosity. Used on parts fixture where above 200℃ is required. Green, super high strength, high viscosity, fast cured speed. Grey paste, fast fixture, large gap fill to 0.5mm. High strength, high viscosity, repair heavily worn hole/shaft assemblies. 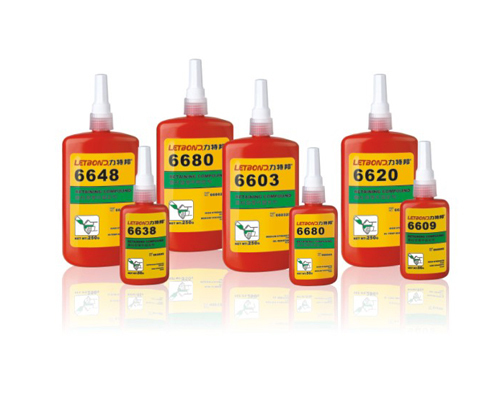 General purpose, green, high strength , medium viscosity suitable for structural Parts assembly.